You are handed a rake and asked to clean a koala enclosure. Easy! There’s no way you can stuff up raking, right? 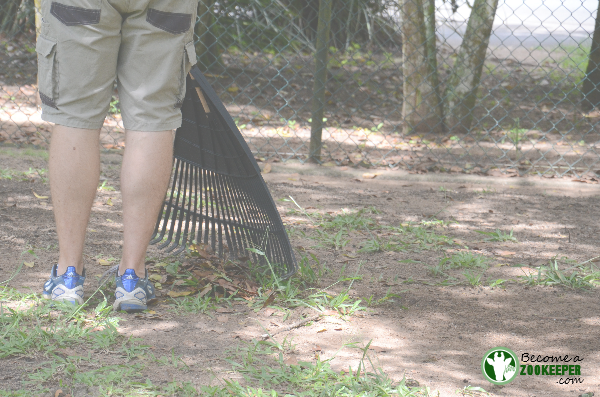 Any seasoned zookeeper will agree that raking an enclosure is an art form. You may think I’m joking, but I couldn’t be more serious. Many of the volunteers I’ve had the pleasure of working with have never even used a rake before, and for those who have, the technique they’ve developed raking leaves off a lawn still needs some tweaking before it’s right for raking up poo in an enclosure. 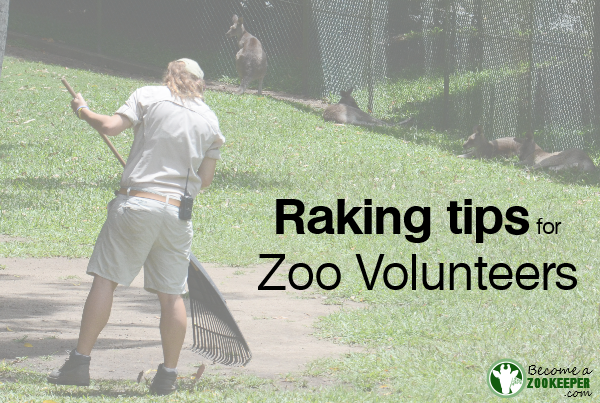 Read ahead for some helpful raking tips to help you impress you zookeeper mentor! Why does it matter how well you can rake? There are several reasons, which will come to light as you read on, but the main one is TIME. Zookeepers often start early, finish late and don’t get paid overtime, so efficiency and good time management are critical. And I’m not talking in a hypothetical way, where you’re demonstrating that you have these skills should a zookeeper vacancy come along. I mean in a very literal way every single day you volunteer. You take too long, or miss too many poos, and your zookeeper may have to give up their lunch break to come back and fix things up. You do a good, quick job and your keeper may actually get to leaveon time for once. You don’t need me to tell you which scenario is better for your zookeeping career prospects! Why do we rake enclosures? To keep the environment clean for the health and wellbeing of the animals. Which rake novice are you? I’ve found that amateur rakers tend to fall into one of three categories. Which one are you? The zen gardener. This group tends to take so long that you could be forgiven for thinking they were creating a giant zen sand garden rather than raking an enclosure! They usually have trouble collecting the poo in piles. The fast and the furious. This group moves a lot faster, but they scrape the ground too hard and instead of ending up with a pile of poo, they have a mound of 80% substrate (sand, dirt, mulch etc.) and only 20% poo. This means we’ll need to replace the ground substrate much more often, which is a lot of work (and can be expensive, too). The long distance raker. This last group rakes all the leaves and poo into one pile, rather than several small piles, often resulting in little trails of poo falling out between the tines along the way. Raking tips: So, how do you rake properly? Start from one side of the enclosure, with the intention to finish at the other end. 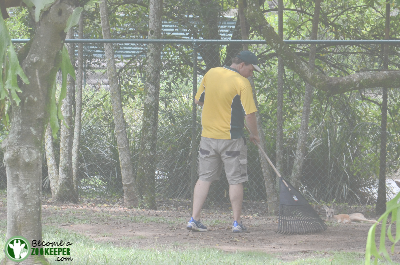 Rake lightly, moving the rake from side to side just a little as you go, to catch all the poo and leaves. Try not to rake up the substrate. You’re probably going to catch some dirt, but just be mindful of not getting too much. Watch out for pockets of poo around tree trunks or in small depressions in the ground. Get the corner of your rake into these spaces and flick them out. Rake all the poo and leaves into piles, then pick up each pile using a dustpan and brush. Again, try to only take the poo and leaves, not the substrate. Try to do this as fast as you can. As previously discussed, zookeepers are time poor, so completing tasks in an efficient manner is important. Have a practise at home on different substrates. Try grass, dirt, cement and even rocks. Each one usually requires a slightly different technique. Practise makes perfect! There are likely to be times when you’re raking an enclosure and the dustpan and brush have gone missing, again! Before you resort to bare hands, have a go at using the upturned rake as your dustpan and your shoe as the brush. Practice at home. Put on some old shoes and take a rake and bin outside. Collect some pebbles and place them in a pile on the ground. Now take the rake and slide the ends of the tines just under the edge of the pile of pebbles. Then use the inner edge of your boot (where the arch of your foot is) to push the pebbles onto the rake as you slowly lean the rake back (away from your foot), or whatever technique works for you. Once you’ve got those pebbles on the rake, lift it up and tip them into the bin. It’s harder than you might imagine! Raking isn’t as easy as you think when you first start out, but if you follow these raking tips I can guarantee you’ll be an expert in no time. If you practise before you’re a volunteer, you’ll stand out from your first day. Now, get raking!